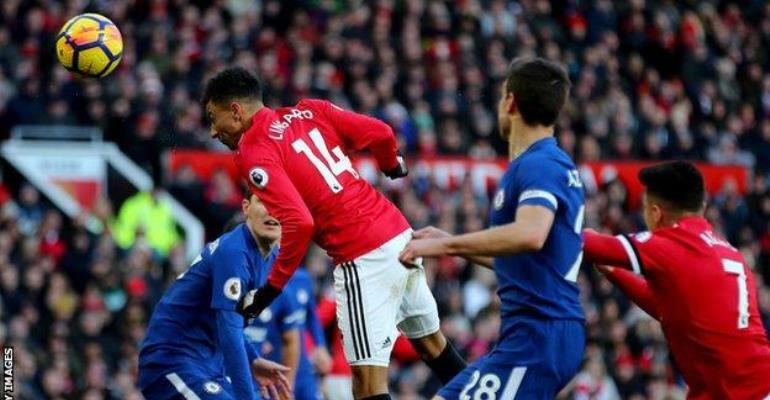 Manchester United moved back into second place in the Premier League as substitute Jesse Lingard gave them victory over top-four rivals Chelsea at Old Trafford. The Red Devils had to come from behind after Willian started and finished a flowing move to give Chelsea the lead in the first half. United pulled level before the break, with striker Romelu Lukaku getting in front of Marcos Alonso inside the area to score against his former club for the first time. Lukaku then set up Lingard to head home with 15 minutes left, after which Chelsea’s Alvaro Morata had a goal disallowed for offside. Defeat leaves the Blues in fifth place after Tottenham beat Crystal Palace 1-0 earlier on Sunday. A run of just one win in their past four league matches, coupled with Spurs’ 10-game unbeaten streak, means they are out of the Champions League places with 10 games remaining. Chelsea came close to taking the lead at Old Trafford after just four minutes when Morata ran on to Alonso’s brilliant volleyed cross, but his shot hit the bar. Lukaku, facing the club he played for between 2011 and 2014, had a flying volley superbly saved by Thibaut Courtois. Lukaku came into the game having scored 12 goals in the Premier League so far this season, but with none – and only four shots on target – against the other teams in the top six. The Belgian, signed for £75m from Everton last July, had never scored in either seven previous league appearances against Chelsea, or 10 for the Blues during a spell in which he enjoyed more success while on loan at West Brom and Everton. But the 24-year-old edged in front of Alonso to finish off a neat move involving Alexis Sanchez and Anthony Martial and end his dry spell against the top flight’s elite. Lukaku came close to a second when he met Sanchez’s superb ball with a flying left-footed volley, but Courtois denied his international team-mate by tipping the ball over. He swung the match decisively in United’s favour, though, when he slipped free on the right of the box and chipped in a cross that Lingard nodded home.